There’s a new post on Watts Up With That (WUWT) called New study – climate system is only about half as sensitive to increasing CO2 as previously believed. It refers to a new paper by Roy Spencer and William Braswell called The role of ENSO in global ocean temperature changes during 1955–2011 simulated with a 1D climate model. The main conclusion of the paper (and why WUWT is so excited) is that they conclude that climate sensitivity is likely 1.3oC, significantly lower than the 3oC predicted via other methods. I worked through the paper a little last night (yes, my life is boring) and I have some issues with what they present. Admittedly, I’m no expert at this so others are welcome to correct my misunderstandings through the comments. What the Spencer and Braswell study does is to consider three situations, illustrated in the figure below. Case I is when there is anthropogenic and volcanic forcings plus diffusion in the oceans. 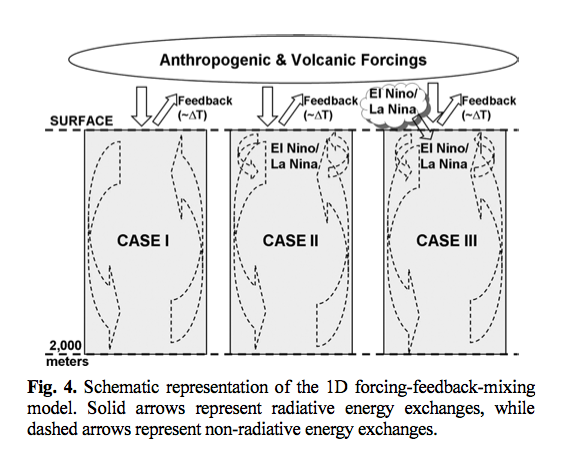 Case 2 is anthropogenic plus volcanic forcings, diffusion in the oceans, and mixing in the upper layers through El Nino/La Nina. Case 3 is one in which there is anthropogenic and volcanic forcings, diffusion in the oceans, mixing in the upper layers through El Nino/La Nina, and an assumed forcing associated with El Nino/La Nina events. The basic model equations are below. As far as I can tell, the model only considers the ocean temperatures and divides the ocean into 40, 50m thick layers. Hence, the model has 40 equations that determine how the temperature in each layer changes with time. The N(t) term is the anthropogenic and volcanic forcings taken from RCP6. The λΔT1 is the feedback term (i.e., the term in brackets in the first equation is essentially the radiative imbalance). The S terms are the terms used to model the El Nino/La Nina mixing, and the final term in each equation is the diffusion term that allows for vertical mixing. The ΔTs in each equation are also relative to some assumed average oceanic temperature profile, including a thermocline, which the ocean relaxes to when there are temperature perturbations away from that profile. In each case considered, the model was required to match the 0-50 m observed temperature trend for 1955-2011 to within 0.002 deg. C per decade. So, as far as I can tell, parameters in the model were tuned so as to match the observed (from Levitus 2012) temperature trend for the 0-50m region of the ocean. So, where is my issue with the model? If we consider Case 1, all the S terms in the equations above are zero and the model is evolved using only the anthropogenic and volcanic forcings and the diffusion terms. However, the diffusion coefficients in the top 6 layers are all different and, unless I’m mistaken, are tuned so as to best match the observed 0-50m temperature trend. So, unless I’m missing something, the diffusion terms don’t conserve energy. Normally you’d expect diffusion to transfer energy between the different layers. Here, they seem to simply act to try and drive the temperature in each layer back to the assumed average. So, it seems that the diffusion terms are simply acting to, essentially independently, add or subtract energy from each layer and are tuned to as to produce a result that matches the observed trend for the 0-50m layer. The other problem is that the climate sensitivity factor, λ, appears to be defined relative to the change in temperature in the upper layer of the ocean, rather than relative to the surface which would normally also include the land. I don’t know if this is a major factor or not in such a simple model though. The next issue I have is that in their Case 2 they add El Nino/La Nina mixing terms, S, to the top four layers. The equations for parametrising these terms are below, where MEI is the Multivariate ENSO index. When they include this they find that the climate sensitivity drops to 2oC, from the 2.2oC they get from their Case 1. Well this seems to be because they’re tuning their parameters to only match the temperatures trends in the 0-50m layer. If this mixing term adds energy to this layer, then that immediately implies that the radiative imbalance term will need to be smaller (so as to keep the energy going into this layer constant) and the only way to do this is for λ to be bigger, and hence for climate sensitivity to be smaller. Fine, but that does imply that the radiative imbalance in Case 1 and Case 2 are different and hence the change in total Ocean Heat Content will be different for these two different cases. Everything seems to hinge on the 0-50m layer. Maybe the biggest issue I have relates to their Case 3. Here they assume that the forcing term N(t) is modified to include a forcing due to ENSO events. The equation they use is below, where MEI is again the multivariate ENSO index and α is a coefficient of proportionality. Essentially, they seem to simply assume that ENSO produce some kind of internal forcing which they say could involve some combination of cloud shortwave albedo, cloud longwave, or water vapor changes. When they include this forcing, the climate sensitivity drops to 1.3oC. Sure, but that’s because you’ve assumed an extra forcing term (that is not really physically justified) and the only way to then match the 0-50m temperature trend is to increase the value of λ and hence reduce climate sensitivity. So, as you might imagine, I’m rather unconvinced by this work. It seems to be a simple 1D model with diffusion terms that can simply be tuned so as to match a temperature trend in the 0-50m layer. Not obvious to me how this is conserving energy as it seems as though the amount of energy that one layer gains or loses is not related to the energy gained or lost in the adjacent layers. Everything seems to be tuned so as to match the temperature trend in the 0-50m layer only, and so there is no sense of whether or not they are matching the overall change in ocean heat content (I would guess not since some of the cases have different radiative imbalances). Finally they seem to simply add an internal forcing term that is largely physically unmotivated and then suggest that, because of this term, climate sensitivity is much smaller (1.3oC) than other estimates suggest (3oC). Well, if such an internal forcing does indeed exist one could have shown that the climate sensitivity would indeed be lower without needing to do any kind of modelling (1D or otherwise). The main problem, though, is that – as far as I’m aware – there is no evidence for the existence of such an internal forcing. This entry was posted in Anthony Watts, Climate change, Climate sensitivity, ENSO, Global warming, Roy Spencer, Watts Up With That and tagged Climate sensitivity, El Niño-Southern Oscillation, Radiative forcings, Roy Spencer, Sea surface temperature, Watts Up With That. Bookmark the permalink. 26 Responses to Watt about Spencer and Braswell? Their previous paper didn’t fare very well. The journal editor decided to resign after publishing it. BTW, its “Braswell”, not “Brasewell”. Lars, I knew I should double check that and then completely forgot to do so. Yes, I remember that story. I should probably have a closer look at that paper. Presumably one issue with the idea presented by Spencer & Braswell (2013) is that if ENSO events can drive long-term warming trends then we should have seen such temperature variations in our past climate history. As far as I’m aware, there is no real evidence for such a process. Watts is not good in science, but very good in PR. Half seems to be the optimum for claims on the temperature record. Less and it would not be interesting to his audience, more and it would be too unbelievable. Spencer has got very serious form for producing controversial results from dodgy 1-box models with large numbers of tunable ocean layers. You may find much of interest in Barry Bickmore’s dissection of RS’s last foray into this territory. More of potential interest from Barry Bickmore. Thanks BBD, those Barry Bickmore posts are really very good. More detailed than I’ve managed here but it does seem that I didn’t completely foul up my analysis of Spencer & Braswell (2013). Victor, you can’t really fault Anthony’s marketing skills. johnl, I presume that Roy Spencer’s 6 trillion degree warming was because in that paper he was integrating the PDO index. The longer the time interval he considered, the lower the initial temperature has to be to then match the recent warming. Victor’s comment pointing out Watts’ Zeno approach almost prompted a coffee explosion here. As a side-note, I see that S&B13 was published in the same somewhat little-known Korean journal that published Lindzen & Choi (2011): the Asia-Pacific Journal of Atmospheric Sciences. L&C11 was rejected by PNAS. Pointing out the flaws in contrarian papers in your “free” time and without fee is a public service, Wotts. Public service of this type is a noble endeavour. I think Wotts gets a certain amount of entertainment from reading contrarian papers and finding flaws in them. I wouldn’t describe it as a boring activity either. Falling asleep at 9pm, which is what I did last night, is probably boring though. Not that I know much about modelling, but I would have said right away that a 1D model is the same as assuming a spherical cow, therefore, a total waste of time for all concerned. Well okay it would be a waste of time if you assumed that Spencer and Braswell were actually trying to do science. Instead they are trying to destroy it. Funny, an ENSO forcing … as if it wouldn’t project on MEI anyways. Spencer/Braswell aren’t even wrong in an interesting ways anymore. Victor’s comment which Doug quoted nails it. Speaking of Lindzen, that paper with Choi may well be his swansong as practicing scientist. He’s retired from MIT, presumably so as to finally and officially acknowledge his career switch to being a full-time public policy pundit. Interesting. I’d actually wondered about this because it seems that this is another issue with the observationally constrained ECS estimates (Otto et al. for example). They only consider a portion of the time over which CO2 doubles, and so they have to assume that the feedbacks will change linearly. If not, as this paper suggest, the ECS one would get using recent observations will depend on the time interval considered. I agree with this, Wotts. The influence of past/present conditions on the observationally derived estimates of TCR/ECS is not accounted for. And as Steve Bloom has mentioned here before, the implication from mid-Pliocene warm period is that non-linear feedbacks do indeed exist. Hansen and colleagues have recently been doing related work. I skimmed over it a couple months back, not enough to grasp the particulars, but this is a good excuse to take a more thorough look. K.a.r.S.t.e.N, that quote is not mine. Indeed they have – Previdi et al. (2013). Include ice sheet dynamics, surface (vegetation) albedo change and carbon cycle feedbacks and estimated Earth System sensitivity (as opposed to S_ff) to 2 x CO2 rises. The big question is how rapidly the additional “slow” feedbacks are engaged. Not something to be excessively complacent about IMO, especially carbon cycle feedbacks (permafrost melt, vegetation, ocean). From peer reviewed papers ,mainstream and sceptical,the range of opinions is from 0.6C to 6.0C. Until Meraner et al 2013, and Previdi et al 2013 I could not find any answer to or discussion even of the basic question .Now it is suggested that ECS is not a constant,that non- linear feed backs may exist , and that the ECS may depend on the Climate state. Silly question I know , but does this mean it is theoretically possible that with the various forcings,(the full significance of a number of which are not fully appreciated) the climate could be skating from one extreme of temperature to another and back again? The climate has been flipping in and out of ice ages for aeons, for reasons only hypothesised. Another question – Is Previdi saying that the ECS for the doubling of atmospheric CO2 from say 100 ppm to 200ppm over centuries past MAY be significantly different (lesser or greater or not known ?) from the ECS for a contemplated doubling from 280 ppm in the pre-Industrial Age to 560 ppm later this Century? If ECS is not constant , other interesting questions follow. Douglas, interesting questions and I should acknowledge that I’m not an expert. Is Previdi saying that the ECS for the doubling of atmospheric CO2 from say 100 ppm to 200ppm over centuries past MAY be significantly different (lesser or greater or not known ?) from the ECS for a contemplated doubling from 280 ppm in the pre-Industrial Age to 560 ppm later this Century? As far as I understand it, they are indeed suggesting that, for example, the influence of feedbacks may be different when CO2 changes from 280ppm – 400 ppm than when it is changing from 400ppm – 560ppm. To a certain extent this makes sense as the various things that provide feedbacks may well depend non-linearly on temperature. So that would imply that the ECS when CO2 changes from 100ppm – 200ppm could be different to when CO2 changes from 280ppm – 560ppm. I don’t, however, have any real idea how significant this difference will be. I’d be surprised if it was significantly different given the paleoclimatological evidence. The significance of this is probably simply that using the observational data from 1880 – 2013 to constrain the ECS is likely going to be an underestimate as it can’t include the changes in the influence of feedbacks that will likely occur as the temperature rises in the future. the climate could be skating from one extreme of temperature to another and back again? The climate has been flipping in and out of ice ages for aeons, for reasons only hypothesised. I don’t believe that the non-linearities are sufficient to be a prime reason for us switching from one state to another. The Milankovitch cycles are quite well understood. The prime driver is variations in solar forcing (both in magnitude and in where the energy is deposited due to changes in the Earth’s orbit around the Sun). Clearly we can only hypothesis and model/theorise what might explain these cycles, but that doesn’t really mean that we don’t understand it well. Please see Hansen et al. (2013) Climate sensitivity, sea level and atmospheric CO2 which directly addresses the state-dependency of S (section 5b). An examination of paleoclimate behaviour (specifically, early Cenozoic) suggests that S is higher for hotter climate states because of increased WV feedback – supporting Meraner et al.